2 channel, 160A peak per channel, 34VDC, dual quadrature decoding. 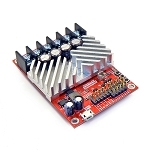 Control from RC receiver, serial, analog, microcontroller or USB. BasicMicro is a leading provider of DC motor drives. If you have a DC motor, we have the motor controller you need. All of our products are high quality. You’ll never need to worry about subpar construction or shoddy parts. Purchasing a premium piece of hardware can be intimidating, especially when your needs start getting advanced, and we promise you’ll be making the right choice by buying your next DC motor controller from us. 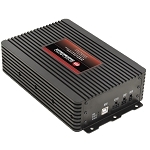 We offer both standard and advanced motor controller models. A standard will work in a pinch and comes with all the features and protections you’ve come to expect from a high-quality brand. If you need further customization and access to more control methods, our advanced DC motor drives will set you on the right path. An advanced motor controller will get you CAN bus compatibility as well as full I/O configuration and scripting. You’ll also get to enjoy torque control, something you may not be able to get with a standard variant. All of our parts have been hand-picked with versatility and quality in mind. 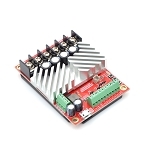 You are getting the best your money can buy at any price point if you pick BasicMicro as your go-to destination for all of your motor controller needs. We are the ideal choice if are a newbie fresh off the boat or if you are a grizzled enthusiast with several years under your belt. We sell good products, and that’s a promise. We aren’t just a retailer. 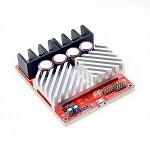 BasicMicro prides itself on selling DC motor controllers that we know how to use. That’s right: we’re enthusiasts, just like you. We understand the hardware and have decades of experience backing our expertise. If you buy a motor controller from us, you are guaranteed to have a team behind you if you need it. We offer technical support for all of our customers through our email channels or on our forum. If your issue is related to one of our products, we’ll work with you until it’s resolved. Our forums are also an excellent place to share quick tips with your fellow hobbyists as well as share your own projects. A little bragging can’t hurt, and we love seeing what our customers come up with while using our DC motor drives. If you prefer working by yourself, that’s more than alright. We also have a dedicated webpage that provides you with any digital information and software (such as drivers and our proprietary Motion Tune suite) you might need for your motor controller. Head on over to our Downloads section and check out what we have available. You can also check out our Resources page. There, you’ll find several guides that can bolster your know-how with the hardware you’ve purchased from us. Ranging from basic troubleshooting to learning how to use new software, our tutorials are ideal for beginners and even those with years of experience who just need to make sure they’re on the right track.